Byron Bay Cookie Company has launched a Pride cookie in partnership with Qantas. The cookie was developed by chef Christine Manfield and is heart shaped with a blend of milk choc chunks and rainbow choc drops. The cookie will be available on selected Qantas domestic and international flights in the lead up to Sydney’s Mardi Gras Parade on 4 March 2017. 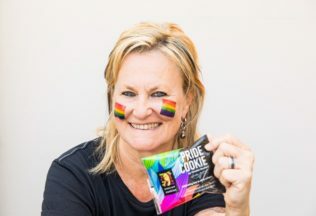 “I’m proud to have had the opportunity to work with Byron Bay Cookie Company to launch the Pride Cookie and bring to life what Mardi Gras is all about,” Mansfield said. The cookies will also be available in selected cafes and through the Byron Bay Cookie Company website with a recommended retail price of AUD $3.50.